Limon librarian Lucille Reimer holds a historical photograph of the town bank destroyed by a 1990 tornado. The building was reborn as a library. See images of the town then and now. 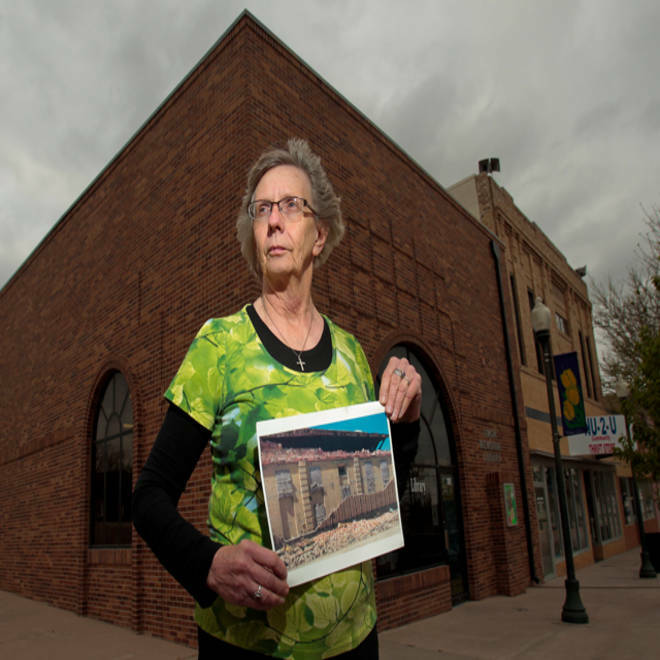 One generation after a 206-mph tornado pulverized and vacuumed away most of the historic downtown and damaged one-third of the homes in Limon, Colo., librarian Lucille Reimer has a small hitch in her voice when she describes the initial dawn after the storm, the first day of revival. “The most amazing site. The sun was coming up. People were just starting to move around. And I saw them — hundreds of police cars, all coming in to help,” recalled Reimer, who was a reporter for the local newspaper, The Limon Leader, when a June 6, 1990 twister nearly scraped away the little village of about 2,000 people in eastern Colorado, injuring 17 people, displacing hundreds, yet killing none. "Seeing all those flashing lights arriving, well, it still gives me shivers." Over the past 23 years, Limon has reinvented its look, retained much of its population and reclaimed its status as a stout plains anchor where stranded travelers find friendly shelter when white-out blizzards close the nearby interstate highway. The town has returned to its reputation as a plucky refuge after enduring a short spell as a place in desperate need of extra hands. The same ragged roadmap — reconstruction and resurrection — has been followed repeatedly in towns slashed or decimated by house-chewing tornadoes. They’re still rebuilding in Joplin, Mo., where on Wednesday residents paused in silence to mark the second anniversary of the twister that claimed 161 people. And they’re mourning again in Moore, Okla., which lost 36 people in a 1999 twister and where searchers this week combed the carnage from Monday’s tornado that took another 24 lives. Looking back, some parallels can be seen when comparing the early renaissance of Limon and the ongoing recovery in Joplin. One year after the catastrophic storm struck Joplin, officials there had erected a new hospital to replace a destroyed medical center. Thirteen months after the Limon tornado, workers had built a new town hall and a new fire station. But there are difficult contrasts as well. Joplin received $1 billion in federal aid to help reassemble. Limon — which sustained $25 million in damage — did not receive a similar federal disaster designation despite its near destruction. Why? "Nobody got killed," said Joe Kiely, Limon's assistant town manager. After the storm, he drove to Limon from his home in Fort Morgan, Colo., 80 miles to the north, to volunteer in the cleanup for one weekend. He stayed for three weeks and later was offered the job of Limon's recovery director. "We used primarily state money, insurance dollars, and donations from the public." More than two decades later, much of Limon barely resembles its pre-storm form. Small trees, planted along the downtown sidewalks during the early 1990s, now are fully mature and starting to leaf out for summer. Limon’s new town hall was constructed with a modern flair. In all, some 350 building permits were pulled there in the months after the big winds. 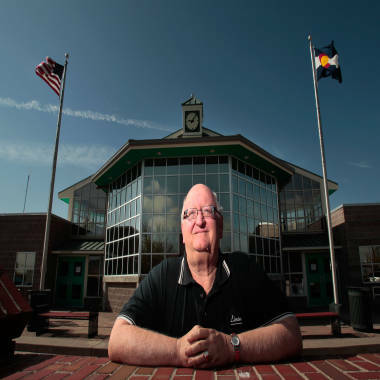 Joe Kiely, 60, stands in front of the new town hall that replaced the old one destroyed in the 1990 tornado in Limon, Colo.
At his town hall office, Limon town manager Dave Stone scans an old photo of the four-block downtown sector taken before the twister. He counts nine buildings that today are gone, including a bank, two restaurants, the local newspaper's former office, a corner gas station, a vintage hotel, the fire station — and the old town hall. "The downtown area is drastically different," said Stone, who grew up there. Leaving after the tornado, he adds, "never crossed my mind." "I wanted to make sure that town did sustain itself," Stone said. "I don’t know that anybody picked up and left town. Essentially, they stayed here and worked together to reconstruct the community." Like any town, Limon has had its comings and goings, its births and deaths during in the past 23 years. But U.S. Census figures back Stone's point: In 1990, there were 1,831 residents; in 2010 there were 1,880. While memories of an eerie aftermath remain thick for many folks — the brick rubble, the contorted metal sheets sheered from dozens of mobile homes, the odd chill that filled the darkness after the super cell passed — it is the warmth of what followed that locals prefer to recount. The launch of the big rebuild seemed to be signaled by that incoming parade of squad cars witnessed by Lucille Reimer. They came from Colorado cities and little burgs to the west, south and east. They followed the twister’s precise path, right down Main Street, where many of the town's businesses, about 80 percent of the local commerce, were ruined or heavily impacted. With security re-established by visiting cops, food became the next necessity. The twister hit just after 8 p.m. on a Wednesday. Normally, trucks pulled in on Thursdays to replenish the local grocery’s shelves. A grocery store in the neighboring town of Hugo, Colo., offered to let those same rigs offload their perishables in its backrooms there so that Limon’s hungry residents could drive over to restock their pantries. But restoring city services — including hooking up utilities and finding temporary headquarters for the police department, ambulance service, government offices and the post office — quickly became priority number one. Simultaneously, anyone with a spare bedroom took in some of the hundreds of people who had lost their homes. In all, 228 of Limon's 750 dwellings were damaged. Some merchants had extra, empty commercial space located away from the ravaged town core, and they offered their storefronts or unused locales to friends and colleagues whose businesses had been blown away, Reimer said. Soon, the Army National Guard thundered in to knock down rickety buildings then shovel up and haul away the massive stacks of debris. Before winter 1990, Limon was free of loose bricks, splinters and metal shards. Compare that to Joplin, Mo., where the 2011 tornado took out 553 businesses in a town of about 50,000 people. One year after that storm, 446 of those businesses had re-opened. Today, road signs ripped from the ground have been replaced. Three new schools are being constructed. "We've made all kinds of progress, just phenomenal progress. I've never seen anything move so fast in my life: new buildings where the old buildings used to be, and businesses, homes, apartments where the old ones all used to be," said Aaron Miller, who owns Midwest Storm Shelters, a local company that constructs residential tornado shelters and safe rooms. His crew has installed at least 600 such units in Joplin since the devastating storm. "But there's still empty lots. Being a lifetime resident, I can say it's not the same. It doesn't look the same. Besides the buildings being different, the trees are gone. Joplin was just beautiful for its big trees (before 2011). Now, you might pull up to what used to be a nice shady intersection that had trees growing over the road, and there's just a street light there." The top photo of this composite image shows family members salvaging what they can from a home after it was destroyed when a massive tornado struck on May 22, 2011, in Joplin, Mo. 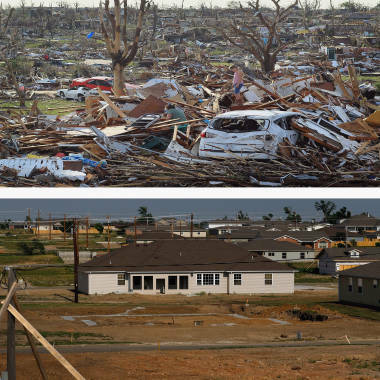 The bottom photo was taken one year after the tornado, and shows the destroyed buildings and rubble have been removed and new homes have been built. Unlike Limon, Joplin sustained mass casualties. And those missing friends and family members cast a personal shadow over Joplin that may take generations to fade, that no physical rebuilding boom can begin to pave over or replace. "We've put storm shelters in for people who have lost family members. We'll put a storm shelter in, now and then, for somebody that has lifetime scars, where you can tell they were in the tornado — scars on their arms, their legs, even their face. They'll tell you: We were in the tornado," Miller said. "We've had a catastrophic loss of life." Limon’s full re-emergence took about five years, estimates Reimer, now the head librarian and treasurer of the chamber of commerce. Local contractors who for years had doggedly competed, trying to outbid and out-hustle each other for jobs, began working side by side to ensure the fastest possible restoration, including resurrecting Limon's grocery store. The overriding spirit on the ground, Reimer said, was marked by "looking out for one another." “It all just gave our community a new sense of pride to kind of change an old town to a new look, a perk up,” she said. "Small towns just take care of themselves like that. But we also had a lot of generous help.